Big news, my little makeup junkies: my company, formerly Allison Barbera Makeup Artistry, is now called Allison Barbera Beauty. Sounds so much prettier, doesn’t it? Why the change? Because thanks to the addition of the wonderful makeup artist/hair stylist/esthetician, Marissa Cote, my company now offers both makeup and hair services for weddings, events, photoshoots, etc. We are also promoting our esthetics services, like Relaxing At Home Facials and Spa Parties. So we are now more than just makeup! I’m loving the name change, and am thrilled to have Marissa on board. More exciting news to come! I rarely go out in public with absolutely no makeup on. But I also don’t always have enough time to really do my makeup (a full face for me, the way I like to do it, can take up to 45 minutes). So I often rock my “No Makeup Makeup.” It gives me a very natural, polished look, requires no brushes and takes about five minutes. Step 1: Apply Too Faced Shadow Insurance eye primer to the lids, using my ring finger, to cover any discoloration and tiny little eye veins. Step 2: Using my hands, I apply Laura Mercier Tinted Moisturizer to my entire face, blending under the jawline and down onto the neck. Step 3: Again with using my ring finger, I apply MAC Select Coverup under my eyes. I also put some around my nose, where many of us have redness, with my index finger. If I have any blemishes, I dab it on them with my pinky finger. Step 4: Two coats of Make Up For Ever Smoky Lash Mascara on the top lashes, just a little at the roots of the bottom lashes. Step 5: Sheer lip balm/gloss/Vaseline/whatever on the lips. Finito! How easy is that? There are some nights when I am so tired I can barely walk. The thought of getting into my pajamas, brushing my teeth, taking my contacts out, removing my makeup and washing my face is too much. But the chances of me going to sleep with my makeup still on are about as good as this diehard Biggie fan buying a Tupac album. It’s just not going to happen. So when I’m having one of those nights, I reach for a makeup wipe to cut out a step. In the past, I’ve had a lot of issues with makeup wipes–they didn’t remove all of my makeup, they made my skin feel dry or tight, they stung and/or they made me break out. I also try to avoid using disposable items when I can (you’re talking to a girl who recycles straw wrappers here, so I never felt good about using something one time then throwing it out. 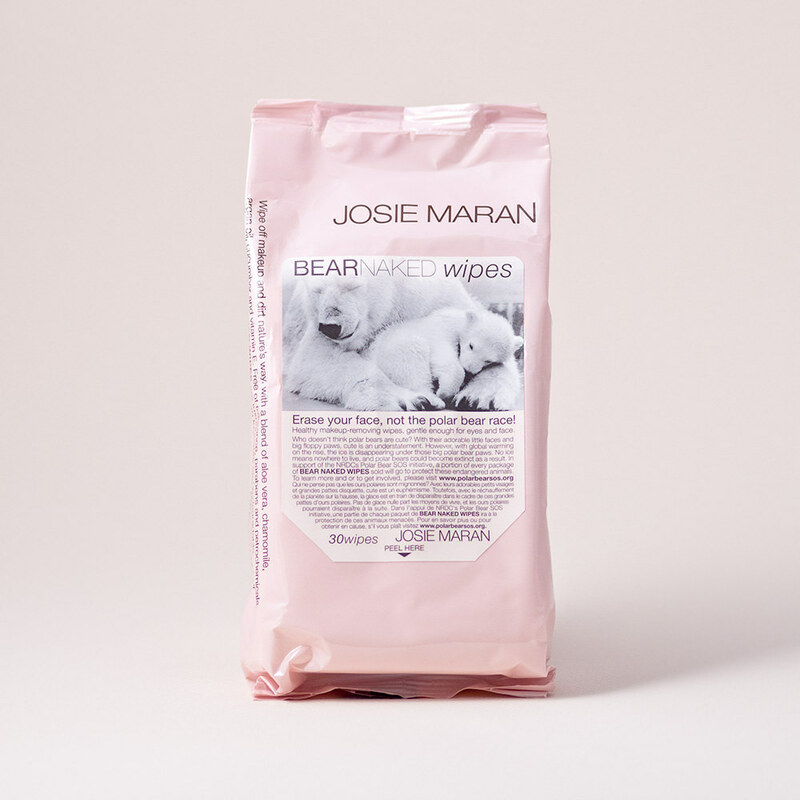 I recently tried the Bear Naked Wipes by Josie Maran and I absolutely loved them. They removed all of my makeup, didn’t dry out or sting my skin (I even used them on my eyes without a problem) and I didn’t break out after using them two nights in a row. Josie Maran is an eco-friendly company, so I was psyched to learn that these wipes are biodegradable. And a portion of every package of the wipes goes to the NRDC’s Polar Bear SOS Initiative to help polar bears, who are now an endangered animal because global warming is melting ice in their habitats. Did I mention the wipes are also cruelty free and don’t contain parabens? I still strongly believe that an oil cleanser or precleanse is the best way to remove makeup, but if you need to reach for a makeup wipe once in a while, I think these are the best for your skin. The Bear Naked Wipes will not only become a part of my own personal makeup supply, but I will definitely keep them in my kit for all the makeup changes during photoshoots and film work. $12 for a pack of 30 at Sephora.